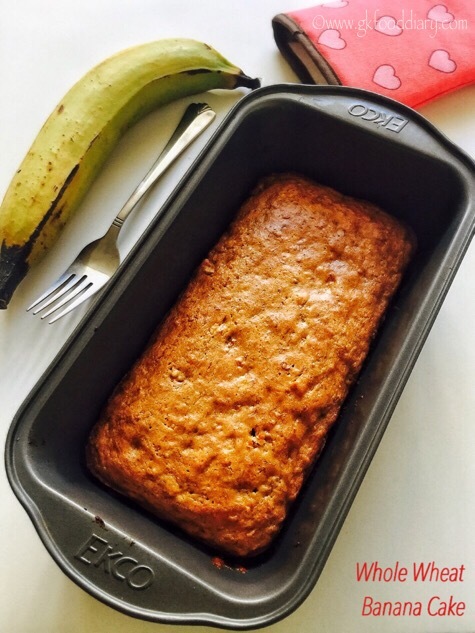 Eggless whole wheat Banana Cake Recipe – easy and healthy cake recipe made with whole wheat flour, bananas, and no eggs! The banana cake will sure be a perfect treat for kids and banana lovers! 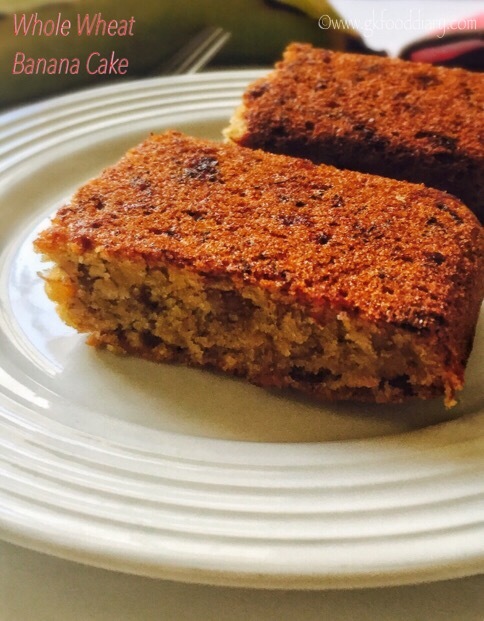 I already have two banana cake recipes in this space with chocolate flavor and plain banana flavor, this banana cake is a slight variation to those and tastes delicious. As I already mentioned banana is my little one’s most favorite fruit, and this banana cake is no exception. She loved this as well. 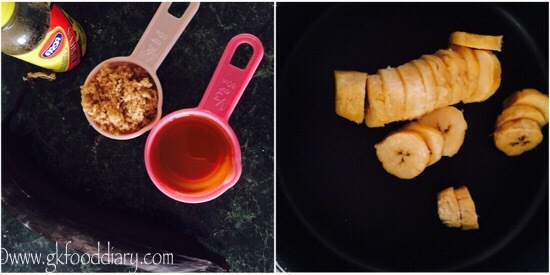 This whole wheat banana cakes can be given to toddlers after one year. 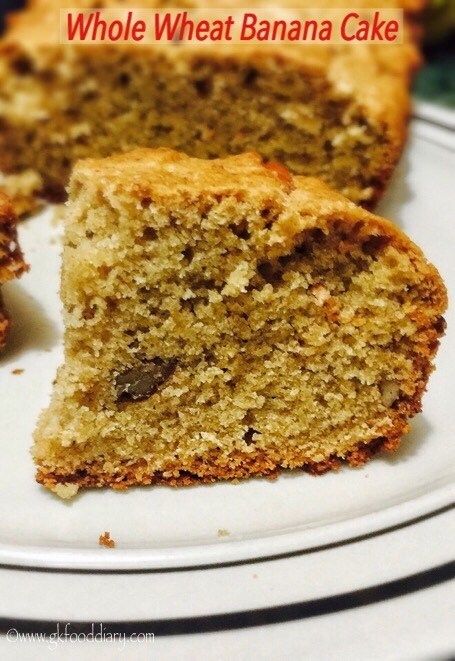 Now Let’s get on to check how to make this healthy egg-less whole wheat banana cake. Measure and Sieve the whole wheat flour and mix well with baking soda, baking powder, and salt. Also, preheat the oven to 180 degrees C for 10 minutes. Measure and keep all the other ingredients ready. Take a ripe banana and cut them into slices. 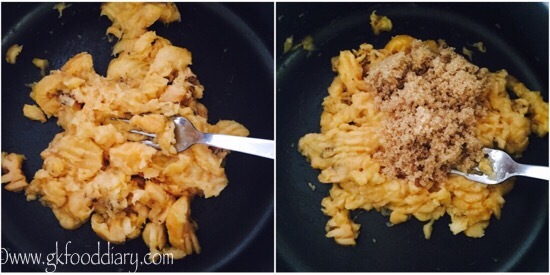 Mash the bananas well with a fork. Alternatively, you can blend the chopped banana pieces in a blender to puree them. Once the bananas are well mashed, add sugar. Then add oil followed by vanilla essence. Stir it well with a hand whisk until the sugar is completely dissolved. Mix well so that the oil is mixed evenly. Once all the wet ingredients are mixed well, add the sieved whole wheat flour mixture to the wet ingredients. Gently fold everything well for 10-15 seconds. Don't over mix. Then add crushed nuts to the mix and give a stir. The final mixture should be thick. Grease a cake pan with oil. Pour the mixture into the cake tin and gently tape it. Bake in the preheated oven at 180 deg C for 35 -40 minutes (baking time depends on the size of the cake pan and oven) at 180° Celsius till a toothpick inserted in the center comes out clean. Allow cooling in the tray for 5 minutes once done. Once the cake is warm, cut into pieces and serve! 1. 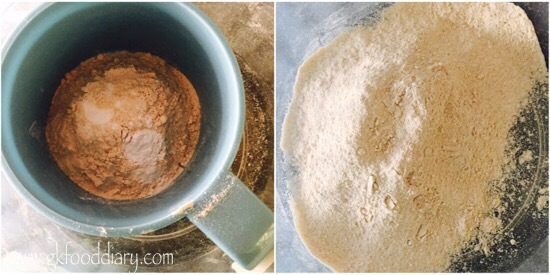 Measure and Sieve the whole wheat flour and mix well with baking soda, baking powder, and salt. Also, preheat the oven to 180 degrees for 10 minutes. 2. Measure and keep all the other ingredients ready. Take a ripe banana and cut them into slices. 3. Mash the bananas well with a fork. 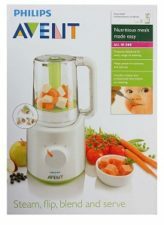 Alternatively, you can blend the chopped banana pieces in a blender to puree them. 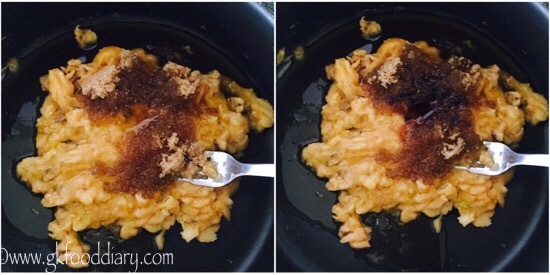 Once the bananas are fully mashed, add sugar. 4. Then add oil followed by vannila essence. Stir it well with a hand whisk until the sugar is completely dissolved. Mix well so that the oil is mixed evenly. 5. 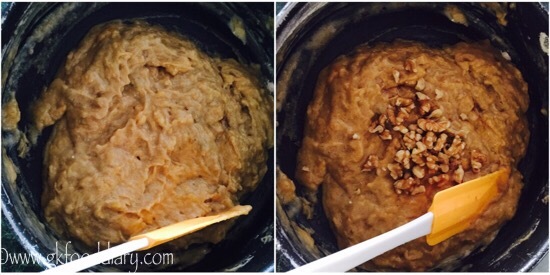 Once all the wet ingredients are mixed well, add the sieved whole wheat flour mixture to the wet, ingredients. 6. Gently fold everything well for 10-15 seconds. Don’t over mix. Then add broken nuts to the mix and give a stir. The final mixture should be thick. 7. Grease a cake pan with oil. Pour the mixture to the cake tin and gently tape it. Bake in the preheated oven at 180 deg C for 35 -40 minutes (baking time depends on the size of the cake pan and oven) at 180° Celsius till a tooth pick inserted in the center comes out clean. Allow to cool in the tray for 5 minutes once done. Once the cake is warm, cut into pieces and serve! 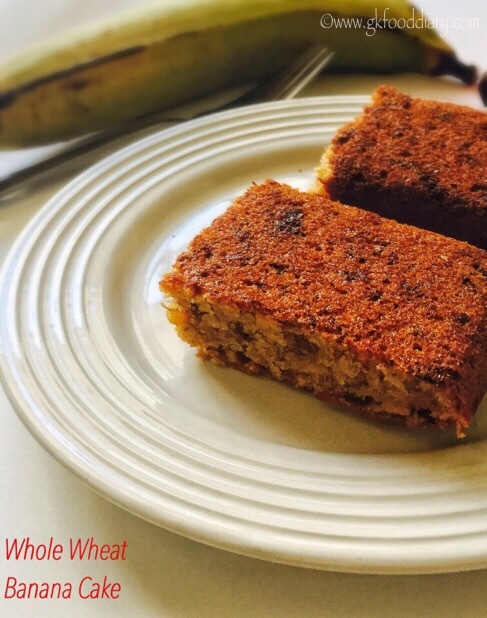 The healthy and tasty whole wheat banana cakes are ready to serve ! 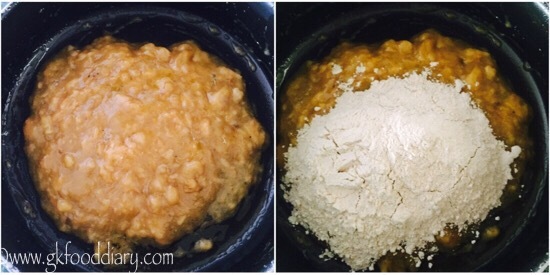 If the mixture is too thick after adding wheat flour, add few tbsp of water. Use over ripe banana for best results. For small babies, finely chop the nuts or powder them in order to avoid choking. 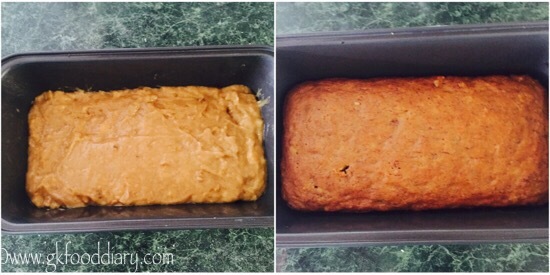 This banana cake stays well for 4 days at room temperature and keeps good for a week if stored in the refrigerator. You could use any nuts of your choice or even chocolate chips. Can butter be used? If so what will be the measurements. Yes. Butter can be used the quantity is as same as oil, 2/3 cup. Hi is there any difference between baking soda and baking powder. yes both are different. baking soda pure sodium bicarbonate where as baking powder is a combination of baking soda plus dry acid! Can ghee be added insead of oil? 1 cup equals to how many grams? I want to try it. Can i mk it in cooker? I don’t have microwave or oven. how much honey I have to use in place of sugar? am not really sure as I never tried baking with honey. Can we omit sugar completely and use another banana or fruit pulp ?? Any option for baking soda n powder ? I am not sure. If you skip it, the cake won’t raise.